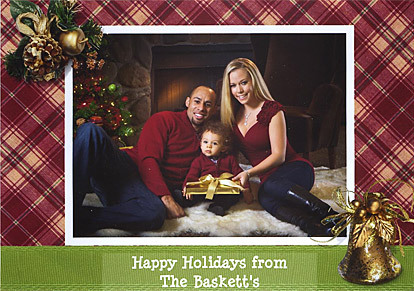 Seen in the pages of US Weekly — Kendra and Hank’s holiday greeting card. @Faith: you were probably askIng why it was incorrect. The reason it should be Basketts is that it is plural. Their surname is Baskett and a noun; any time a noun is plural, an s is added to the end. Anytime a noun is possessive, an ‘s is added. In this case their name is plural. @ Faith. There should be no apostrophe. Name should just read “Basketts”. Going to hell in a hand baskett. I’m 10 and in a language arts class. Could you tell me what is wrong with this greeting card? Thanks. Proof that that family is a Baskett case?